My mother-in-law was a wonderful gardener. She planted the most amazing gardens around their beautiful stone home in Chestnut Hill, PA, just north of Philadelphia. Of course I didn’t really appreciate them until I started working at Viette’s and began learning more about plants and horticulture. 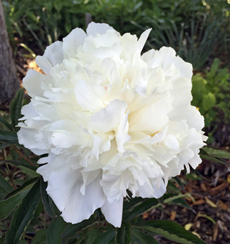 I had always had a vegetable garden but until then, I had never really developed an interest in flower gardening and landscaping. I remember how delighted she was when I first started working at the nursery 26 years ago. We would often stroll through her gardens and talk about perennials and gardening in general. We went to the Morris Arboretum several times and also spent a day at the Philadelphia Flower Show one year. It was really nice because it helped create a very special bond between us. Gardening tends to do that – don’t you think? Our rhododendrons aren’t nearly as grand as the ones in Chestnut Hill but they’ll get there eventually. Most of her gardens were shade gardens because there were lots of beautiful mature trees surrounding the house. 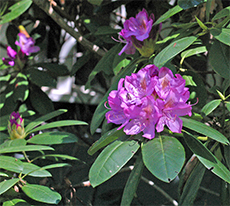 Several grand old rhododendrons were planted around the big wrap around porch and these provided a spectacular show in the late spring. Instead of grass, the front yard was mostly covered with a beautiful purple-leaved Ajuga and patches of velvety, bright green moss because there just wasn’t enough sun for a lawn. I remember thinking how cool that was! Her perennial gardens were full of really interesting and unique shade loving plants that she had collected over the years. I remember being excited that I was able to identify most of them and even give the botanical names for them. Thanks, Andre – she was quite impressed! Even the spent flowers are interesting. I would often bring her a bunch of Viette perennials when we went up for a visit. She would get so excited and we would walk around the gardens to find just the right spot for each one and then we would plant them together. 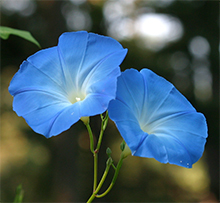 One of her favorite things to plant, though, was ‘Heavenly Blue’ morning glory. 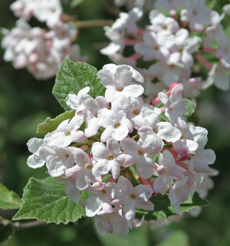 She always had some of these beautiful twining vines growing in a patch of sun somewhere in one of the gardens. They were so pretty! When they moved out of the big house and into a smaller place, she moved a lot of her perennials as well so she could start a new garden there – and still, every year, she always planted some ‘Heavenly Blue’ morning glories! 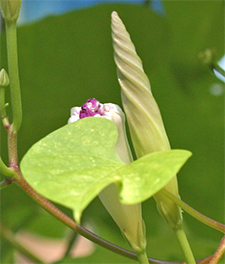 The spiral bud of a morning glory is beautiful in its own right. 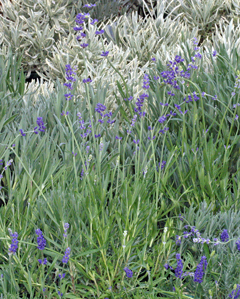 When she eventually moved into a small apartment on the ground floor, she planted her Heavenly Blue’s in her patio garden off the living room. Eric always had to pay a visit to the upstairs neighbor so he could lower strings down from her deck to the garden below to give the morning glories something to climb on. Her neighbor never minded though because eventually the morning glories made it up to her deck and provided beautiful flowers for her to enjoy! The flowers of this vining plant are a glorious deep sky blue and as their name implies, they open early in the morning and fade by mid afternoon. But even as they fade, they add interest because of the unique way that they melt away with the petal tips slowly curling into themselves. Even the flower buds add an interesting touch with their unique spiral shape. Eric’s mom is no longer with us and we miss her dearly. 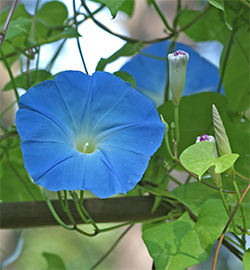 But this year, in her honor, we planted some ‘Heavenly Blue’ morning glories on our deck. They have been blooming beautifully all summer and are actually still blooming now even though the foliage has completely died back. The vines have matured to a beautiful red and every morning several brilliant new blue flowers open up reminding us of a wonderful mom and lifting our spirits as we have breakfast. Yesterday afternoon, Sam Harris of Sam Harris Designs came to the nursery to do a workshop on container gardening. 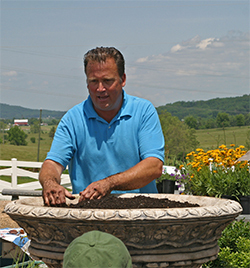 It was really fun to listen to him and watch as he created the most amazing “garden” in the giant urn that has become one of the focal points in the Viette Garden Center. Sam combines perennials like this bright pink ice plant, Sedum 'Angelina', Salvia, daylilies, and even a colorful Caryopteris 'Hint of Gold' with pink petunias and 'Diamond Frost' Euphorbia. It’s not just that he created an incredible, show-stopping masterpiece, it’s how he went about doing it and what he put in it! I was astonished that about 60-70% of the plants he used were perennials. I have never really thought about putting perennials in my containers but then I really just have small hanging baskets off my deck. 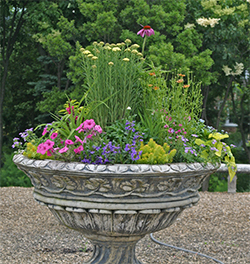 Sam prefers to design giant container gardens in great big pots or huge cement urns like the one in our garden center. “If I’m going to create a container garden, I want it to be seen – not just close up but I want it to WOW people from a distance!” And that’s what he does. 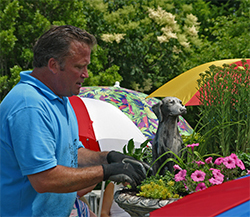 Sam has designed beautiful gardens and containers for many businesses as well as both private and public homes including the Gillette Garden at the Executive Mansion in Richmond. Good soil prep and good drainage are key to a successful container garden. The secret to a successful container garden, according to Sam, is good soil preparation. For the planting medium, he prefers to use a mixture of pine fines (finely ground pine bark) and a quality potting mix like Scotts Miracle-Gro Potting Mix, Espoma Organic Potting Mix, or ASB Greenworld Container Mix. After planting, he always gives the plants a shot of Miracle-Gro Quick Start to give them a boost and to prevent transplant shock. Perhaps just as important as a good soil mix is the presence of a drain hole in the container. Nothing kills (most) plants quicker than waterlogged soil! Before filling your container, place a piece of nylon window screening or landscape fabric over the drain hole. This keeps it from becoming clogged with soil. Sam actually likes to use a plastic pasta strainer or even a sink strainer over the drain hole in his containers. On top of this he recommends layering some lava rocks and then some pine bark nuggets to provide additional drainage. After this, fill your container with your potting mix and you’re ready to roll. 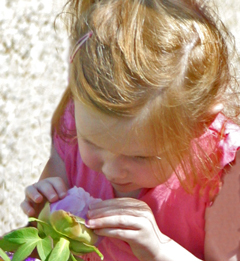 Now comes the fun part – choosing the plants! 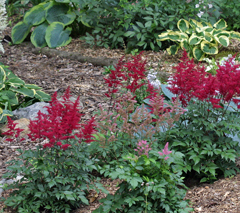 With an artful eye, Sam placed perennials and annuals into the urn, dividing some of the low-growing sedums into pieces and tucking them in around the edges. As I mentioned, Sam bustled around our garden center benches picking up various perennials; Achillea, Coreopsis, Dianthus, daylilies, Sedum, Leucanthemum, Salvia, and more. 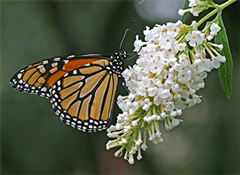 He explained that some perennials like the daylilies make a wonderful show for a while but once they finish blooming, “I just pop them out and stick them in one of my perennial gardens and then next year, it will bloom in the garden and I still have my investment – just in a different place. Sometimes I even sink the pot and all in my urn and then switching out the plants is even easier.” In place of the plants he pulls out, he sticks in a new, fresh perennial or annual – whatever strikes his fancy at the time! 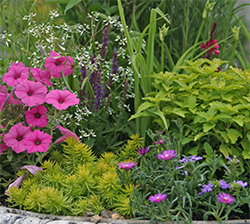 The beautiful container garden will grow over the next several weeks, becoming fuller and spilling over the edges. 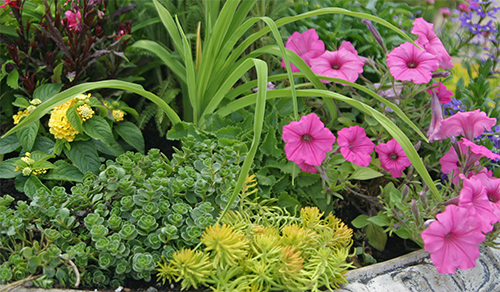 What a great idea – recycling plants from a container garden to the perennial garden. This can be done with all the perennials in the container at the end of the season! Some of the smaller perennials like the Dianthus and the colorful ground-hugging Sedum ‘Angelina’ will provide color and texture all season long with their beautiful foliage and will easily overwinter in the urn. For season-long bloom, Sam tucked in various annuals here and there; some colorful petunias, Verbena, Scaevola, Lantana, Euphorbia ‘Diamond Frost’ and others. The whole effect was spectacular and will only become more amazing as time goes on. I can’t wait to see how it changes over the next few weeks! 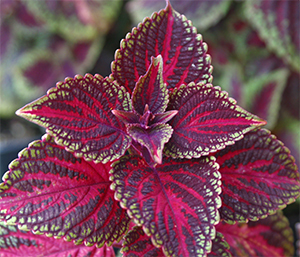 This striking coleus will really brighten up your container! 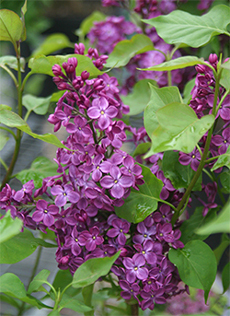 Looking for beautiful but unusual color for your summer and fall containers or flower beds? Look no further! Coleus is King! I never thought too much about these tender perennials until my husband started incorporating them into the containers on our deck. 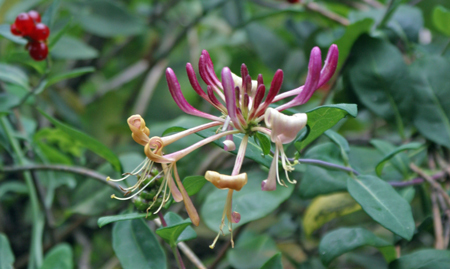 They are truly awesome foliage plants with incredible diversity in leaf color and form. I have often written about the extensive hybridizing of different perennials like Heuchera, Pulmonaria, and ferns, which has focused more and more on the creation of unusual foliage color and texture. Coleus have been undergoing the same intensive hybridization process and the results are some incredible new varieties that will knock your socks off! They have even come up with colorful forms that have interesting ruffled and heavily textured leaves! 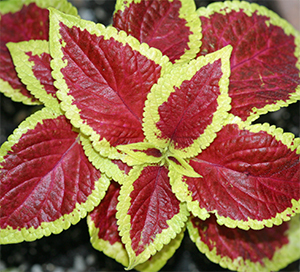 Coleus come in a wide range of amazing color combinations. Wild colors make a splash! And it’s not just the color of the foliage that’s evolving! These new cultivars are much more versatile in use than the older forms because they are able to tolerate a wider range of sun and soil moisture conditions. Some of the new hybrids can tolerate full sun and even some dryness; conditions that older varieties just couldn’t survive in very well. Some of these very colorful coleus can be grown from seed, but many of the most exciting new hybrids are propagated from cuttings and can be found in larger full service garden centers. 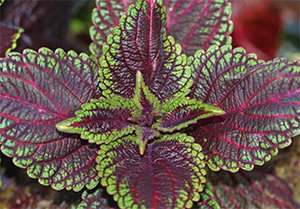 So spice up your summer containers with some HOT new Coleus – they are super COOL!